The Fonn pullover from Lopi Book #25 is knit using Lopi Lite yarn. 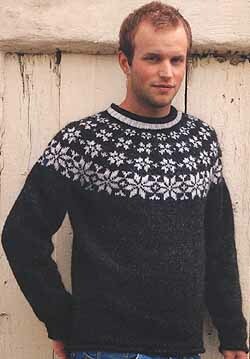 Yarn kits for this design in 4 sizes for both men and women are described below. The pattern is not included in the kit but is in the Lopi Pattern Book #25 (pictured at right) which can be ordered separately. This book includes full instructions for this as well as 23 other designs. To order simply specify it as a separate line item on your order form. Sample cards are available for most of the yarns we sell. For pricing and ordering information, contact us at nmanners@camillavalleyfarm.com.